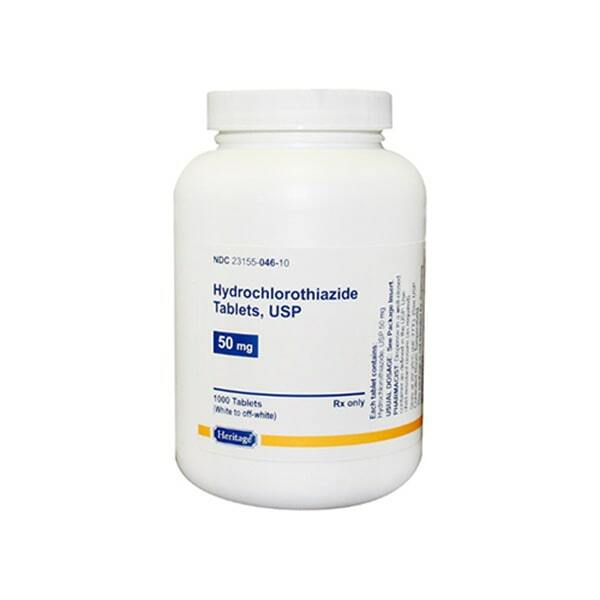 Hydrochlorothiazide is used for reducing edema in the body that may occur as a result of certain conditions like kidney disorder, cirrhosis, steroid use or congestive heart failure. Hydrochlorothiazide limits the absorption of salt in the body which can cause fluid retention. Hydrochlorothiazide may be taken with or without a meal. Store Hydrochlorothiazide in a cool and dark place at room temperature. Do not store it in a place where it can get exposed to direct sunlight or moisture. Before using Hydrochlorothiazide, you should consult a physician and discuss about your medical history. Your blood and urine will need to be tested if you are dehydrated or are vomiting. You will be urinating more frequently. This may cause you to get dehydrated. Ensure that you ask your doctor about getting sufficient salt and potassium in your diet. Hydrochlorothiazide may interact with some medications. So if you are using any prescription, non prescription, OTC medicines or dietary supplements, then inform your physician in advance before you use Hydrochlorothiazide. Diarrhea, constipation, stomach pain, dizziness, spinning sensation or mild itching or rash. These side effects usually subside by themselves in sometime as the body gets used to Hydrochlorothiazide. Ringing in your ears, hearing loss, itching, loss of appetite, dark urine, clay-colored stools, jaundice (yellowing of the skin or eyes), severe pain in your upper stomach spreading to your back, nausea and vomiting, weight loss, body aches, numbness, swelling, rapid weight gain, urinating less than usual or not at all, chest pain, new or worsening cough with fever, trouble breathing, pale skin, bruising, unusual bleeding, feeling light-headed, rapid heart rate, trouble concentrating, low potassium (confusion, uneven heart rate, leg discomfort, muscle weakness or limp feeling), low calcium (tingly feeling around your mouth, muscle tightness or contraction, overactive reflexes), headache, feeling unsteady, weak or shallow breathing; or severe skin reaction -- fever, sore throat, swelling in your face or tongue, burning in your eyes, skin pain, followed by a red or purple skin rash that spreads (especially in the face or upper body) and causes blistering and peeling.